Will return then, still getting back up to speed, and will revel with you then! 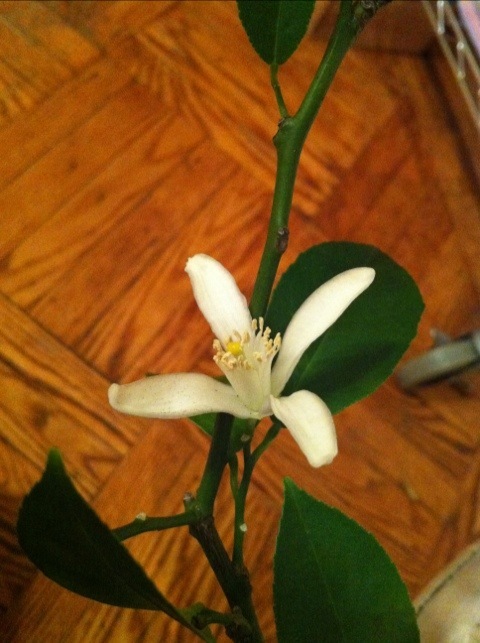 (The Meyer lemon tree is starting to bloom again, welcoming me back to the world and reminding me of new beginnings). What’s happening in your neck of the garden? Go ahead … Gimme the dirt! Welcome back, how are you? Your lemon tree looks happy. It’s been a few months, but the very first red ti branch I put into soil is growing a small branch out of it’s side. I think the longer periods of sunlight had a lot to do with it. The horizontal branch with a few small buds looks like it has a little activity on it too. The bamboo is sprouting small branches and leaves all over the place. From what I heard I probably should have left it outside, but for now it doesn’t seem to care. Yesterday I pulled up the cardboard covering my planting area since the beginning of the cold weather. Some apparently very hearty plants were growing under it. No idea what they are yet, possibly some of the seeds that never grew last year- or weeds. Not much else growing, except the anticipation of getting the garden back into production again. I found a nice surprise today! A brand new 3 inch tall bamboo shoot (culm). I could have missed it yesterday, but for how fast they grow I doubt it was there. I decided to identify it by name, 2012-2. It’s the 2nd new culm of 2012. If it’s similar to 2012-1 it should exceed 5 feet tall in about 3 weeks. It’s scary to even think how root bound this thing is, but I am working on plans to make a big planter for it outside come summer. My pot of sage has been outside a couple days now. It is showing the effects of not enough sun all winter. The stems are very long and ‘spindly’ with small leaves, I’ll probably cut some off to get new growth going again. The red ti is making painfully slow progress. I think it’s waiting for lots of hot sun. The banana plants seem to be doing better with some extra water. They’ve been slowly and steadily unfurling new leaves which is good. No signs of new plants starting yet, but it may be too early for that. Aside from the oregano I forgot to water a while back everything else is doing well. A little more warm weather and I’ll rake all the leaves up into a pile and try to compost them. How are you doing your compost? I’m ready to turn mine (which is a big job, but makes me very happy when it’s done). I was dedicated to composting all winter long, which means everything non-meat went into the scrap bin and out to the compost container. There came to be so much that I had to start putting it into a plastic bin mini-compost container off to the side. Do you have your banana plants outside yet? Mine has been happily unfurling leaves, and looks healthier than before but I’m still not sure I’ve got them in the right places. They are finnicky on how much sun they can get/don’t want. Then again, I have found that sticking it out with a houseplant usually pays off in the end. I’ve had many that I was just about to give up on and they suddenly surprise me (Meyer lemon tree being a case in point).